He was joking. His congregation has a lot of free-range children. But I think he was right. Once the service begins in that icon-filled space, your typical Protestant is hard pressed to make much sense of what is going on. Just like a first-time listener to John Coltrane’s Jazz. It is confusing even if the whole thing is in English. That is not a given. Many Orthodox parishes have strong ethnic identities, so the service you stumble into might be in any of a half dozen languages. When I made my third or fourth evening visit to one church’s Vespers service, I was unavoidably delayed. I arrived almost halfway through, and apologized to the priest afterward for being late. Late?” he said, “What’s ‘late’? There’s no such thing as late. His face showed that he genuinely meant it, but his eyes were twinkling. And when you arrive for Liturgy, punctual Protestant that you are, your sense of time will be thrown off. Even if you came five or ten minutes early, people will already be singing, there will be readings, and clergy in vestments will be doing things here and there. It has begun without you. There probably aren’t many people there yet — possibly only the Priest and a couple singers at the chant stand. But this pre-service-service will be so elaborate you might be miffed on their behalf. How could the members just blow this off? The Orthodox don’t mind. The important thing seems to be to offer praise and prayer to God, and to do it in beautiful ways that honor God. Whether people come or not is secondary. That’s a contrast to Protestant churches — if people don’t come we think the service is a failure. For the Orthodox it is important just to do it. This different attitude to time is akin to the difference I noted regarding Orthodox churches and their domes. Entering the church you you step into heaven, and the eternal activity of heaven is worship. Of course it is going on before you get there. The Western Christian thinks of worship more as a service we offer to God. We show up. There may be a musical prelude, but at a particular point there will be a formal beginning, a “call to worship.” Once the service starts it continues to its end. Then we leave. None of this happens in the Orthodox Liturgy. People don’t seem to strive to be there “on time.” A few may have shown up for Matins or the Hours. A few more will arrive around the first official words of the Liturgy. Then they will continue to trickle in for the first half of the service or more. Chances are worship will even continue after the Liturgy is done. Someone will be singing psalms at the chant stand even as you leave. The second bewildering thing for the visiting Westerner is a matter of music — if you take music as a metaphor for the way the service flows. I’ll say more about the inner structure of the Liturgy in my next installment, but today I want to give you a pair of evocative metaphors — Western and Orthodox worship are different in the same way as two different, but equally familiar, styles of music are different. Think of a Protestant or Catholic service as akin to an open-mic night for singer-songwriters. 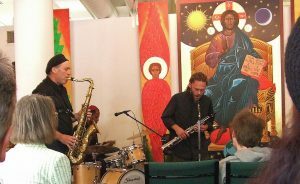 Imagine the Orthodox liturgy as kind of like a jazz combo. It happens one act at a time. If it has been planned with care everything hangs together on a theme. But it has a linear quality, an item-by-item sequence. If my singer-songwriter open-mic analogy seems lowbrow, you could also say Western worship is like opera — arias and recitatives along with actions that move through a more or less dramatic story up front, on the stage. That works too. But Orthodox worship requires a different musical model. I liken it to a jazz combo, though my Orthodox friends seem to favor a symphony orchestra. One instrument, say the violins, plays a theme, and for a while they are the main focus. Then someone else, say the woodwinds, take up the theme, changing it a bit, maybe playing it in a different mood or style. Maybe the brass or the bass fiddles come in with a different theme, something that sort of answers the first theme and carries the conversation forward. Underneath it all is the percussion section, a bunch of kettledrums underscoring the rhythm and carrying their own counter-theme. I think this captures something of what is happening in the Orthodox Liturgy. Again and again let us pray to the Lord! …let us commend ourselves, and one another, and our whole lives to Christ our God! That intercession is one of the main themes. Second there is the choir, who lead’s the people’s responses — the second instrument carrying theme and its variations, contrasting with the Deacon’s intercessions. A couple are sung at every Liturgy. Some are in an eight week cycle for Sundays. Others are assigned to the season of the church year — Advent, Lent, and so on. Still others are specific to the saint or saints whose lives are remembered on that particular day of the calendar. Third you have the Priest, usually up at the altar table. He leads particular prayers, related to each portion of the Liturgy and especially to the celebration of the Eucharist. Some he prays quietly for God’s ears alone, other times praying aloud for all to hear and affirm. Everything the priest does is crucial, central to the meaning of the Liturgy. His work is like those kettledrums and the strings at once, marking the rhythm and carrying the tune underneath all the tunes. So what seems at first like chaos, with different people and groups saying and singing different things — the same kinds of things, slightly different each time — is really a holy symphony of praise. If you can accept my basic metaphor, Orthodox worship is a subtle and complicated form of music. Note, please, that both jazz and classical music are acquired tastes. It takes some time, and some careful listening, to catch the themes in conversation with each other, to follow the flow. But any music lover will tell you that both jazz and classical music are worth the effort. And so it is with the Liturgy. It is worship you grow into — for a lifetime. This post is part of a series. To start reading at the beginning, click here. To go on to the next post, click here. Thanks Steven! You’re in Wyoming right? There is a directory website that pulls up six options. (If you do go for a visit, be sure to check websites or call to make sure it is English. The Antiochians are very likely to use English but the Greeks could go either way.